Vintage Ice Cream Van hire Cambridge from Sweet Ally Scoops. Serving ice cream and charm from Lottie an adoringly restored multi award winning 1973 soft pink and white Bedford CF vintage ice cream van. Based in Ely, covering all of Cambridgeshire and parts of surrounding counties.Bedfordshire, Suffolk, Essex, Norfolk, Hertfordshire, Northamptonshire and London. 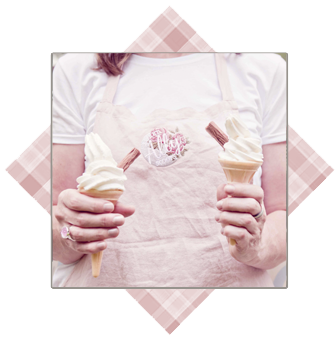 Sweet Ally Scoops would love to provide you and your guests with scrumptious local award winning handmade ice cream, vegan friendly and dairy free sorbets. Lottie can also provide a classic 99 Mr Whippy soft ice cream cone from her original Carpigiani ice cream machine and a selection of traditional lovely ice lollies. Soft drinks in retro glass bottles are also available on board! The quintessential addition to any wedding, birthday party, christening, anniversary party, festival, ball, sporting event, vintage fair, fetes, country show, corporate event, television, film, and media work. Based just outside of Cambridge, Sweet Ally Scoops is located in Ely and can travel a 40 mile radius to attend your event or party but can sometimes travel a little further so always get in touch!